A routine is formed. Get up at 6:30AM. Pack up everything by 7:00AM. Eat breakfast. Begin to hike from 7:30AM to 4 or 5 PM. Unpack and change out of sweaty clothes. Choose dinner from the same menu as the night before (even though it’s a different tea house in a different village). Have a big thermos of tea, put on all of the warm clothes I have with me and go to bed at 9PM. A simple and predictable life. It’s amazing how fast you can adapt when you have to. It only took about 4 days of hiking and we were in a predictable rhythm. Even though the days were predictable, I was still constantly torturing my psyche on trying to predict whether we’d make it to the pass or not. I would vacillate back and forth rapidly. Yes we can do it; No, we’ll never make it. It was quite exhausting! 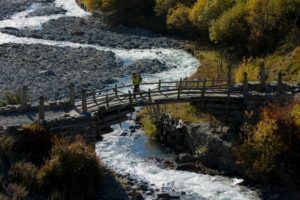 In addition to worry about the altitude on the Thorong La pass, I was constantly worried about my father and his ability to complete this hike as well as his health and safety. As routines formed, other things were in constant states of change. We were making our way to Manang (via Chame and Pisang), the rest spot on the 21 day trek up the mountains. As we gained bits of altitude, we lost oxygen. As the altitude changed, our bodies tried to adjust and adapt. The initial signs of thrusting our body’s into this high altitude was beginning to show. My sleep was restless; tossing and turning in the night. This was accompanied by crazy, vivid dreams that would wake me up in a cold sweat; all symptoms of existing in a higher altitude. I wondered if I would ever have sound sleep again.